Ripe Maple clusters ready for harvest. 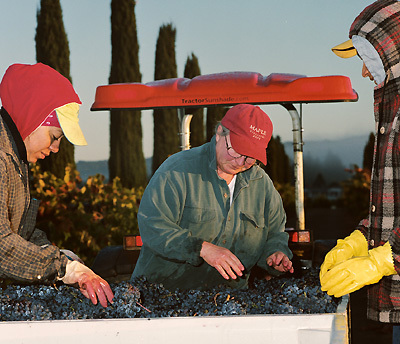 Tina and crew sort clusters at early morning harvest. 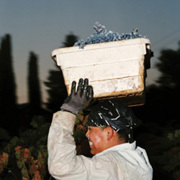 Dawn frost covers the clusters right before an early morning harvest. We head-train vines and limit fruiting positions (spurs) to no more than 10 for the strongest vines. Dry Creek Valley in Sonoma County is one of the most perfect locales and climates (terroirs) for growing zinfandel grapes. 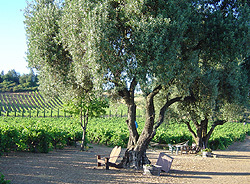 Maple Vineyards is 27 acres of benchland at Dry Creek and Lytton Springs Roads, a few miles northwest of Healdsburg. Tom and Tina personally tend more than 15,000 vines (his and her tractors). We are growing wine in the vineyard. However overused that phrase may seem, it is nevertheless, real and true here. The growing style and yield limitations we employ have resulted in long term relationships with wineries and of course, excellent Maple Vineyards-designated zinfandel wines. We decided from the outset that traditional or old-fashioned farming techniques best suited our vines, ourselves and our grape growing goals. VARIETIES. 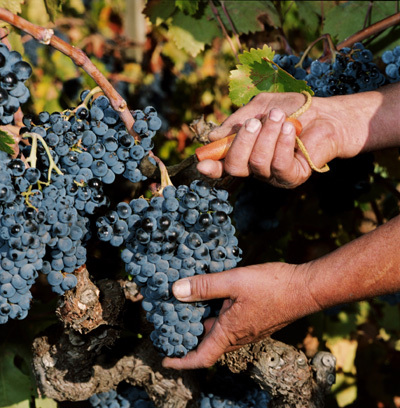 We specialize in zinfandel, with compatible varieties (in terms of grape growing and wine making) such as petite sirah and carignane included in measured doses. Wines from our vineyard will have a specific character thanks to enrichment from these other varieties. YIELDS. Most winemakers believe that controlling fruit production is one of the most important ingredients in creating ultra-premium wines. In the case of our zinfandel we limit the per vine production which concentrates and intensifies the flavor and varietal characteristics. To achieve this we prune each vine in such a way as to keep the fruiting positions, or spurs, to 10 or less. Then in the spring the new, excess shoots are removed to leave only those fruit positions that we left at pruning. Generally, growers who agree to limit crop yields actually cut off grape bunches  called thinning  after veraison (color change from green to red). We believe that our practice of limiting the vines ability to overcrop, from the beginning, reduces the need for thinning, and the vines energy is not squandered in excess crop that will eventually be thrown away. TRAINING, PRUNING, SPACING. 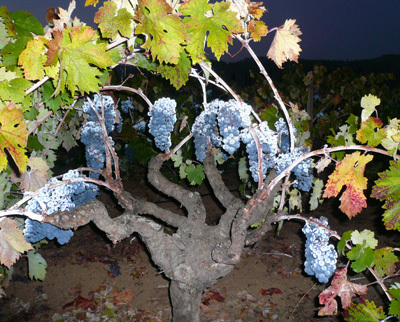 Referred to as head-trained, spur-pruned, the vines have a central trunk around which arms radiate in spoke fashion. This goblet shape allows for even sun exposure, wind circulation, distribution of the grape bunches and ripening. The style, along with spring suckering (removal of excess shoots), limits the amount of fruit per vine. No wires or trellises are present to impede our ministrations around each plant. An 8x 8 spacing gives each vines roots and foliage 64 square feet in which to grow - a time-proven formula for the style we employ. MAINTENANCE & REHAB. We use a very labor-intensive, expensive routine to replace dying vines in the vineyard. Each year Tina uses a small backhoe to dig a large, deep hole and to sift through the soil to remove as many roots as possible (which often contain the cause of the vines demise). Amendments and beneficial micro-organisms are added to the vine space and it is allowed to rest before being replanted with a new, healthy St. George or 110R rootstock. The following year, the rootstock is grafted with a scion bud (usually zinfandel from our own vines) appropriate for the block. TREES & BIRDS. Trees dont usually fit in modern farming - theyre inconvenient to work around and take up vine spaces. Yet there was method to the old madness. A person (or dog) working in the vineyard needs shade and respite. So, not only have we left trees in the vineyard, weve actually planted more. There are stone pines, columnar cypress, olives, magnolias, redwoods, mountain ash and black, blue and coast live oaks. Numerous nest boxes attract a huge variety of birds which keep the insect and rodent populations in check. BILL & SHORTYs blocks. Mostly zin with a smattering of carignane, planted in 1940. Named for Bill Smith who first inspired us and from whom the North Vineyard was purchased in 1988. And for Shorty, our hard-headed, floppy-eared blue heeler (Australian Cattle dog) female (a.k.a. Semper Fi). GENE, IRMA and MAGGEEs blocks. 100% zin. Our first planting effort, 3 blocks of 2-year-old benchgrafts were put in in 1990 to replace berger and green hungarians (unpopular white grapes we could not sell) using the Weise clone from Kenwood on St. George rootstock. This is where we committed ourselves and our future to the traditional style of grape growing. TWISTED OAK block. As barely 1/3 of the old vines in this block were still viable, it was replanted in 1994 using 100% zinfandel budwood from Shortys block. Some years before replanting a black oak sprouted near the road where a vine once stood and to save it from tractor blight we twisted and tied its several small trunks together. It stands majestically today, providing shade for people and dogs and perches for raptors. And the twists in the trunk are still visible. TINAs block. 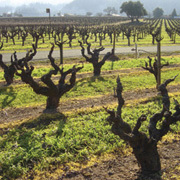 Old, old (1910) vines in a vineyard mix of zinfandel (80+%), petite sirah, carignane, mission, black malvatia (a.k.a cincault), grenache, and some still-unidentified-black grapes. Originally it was slated for removal because of its mix and decrepitude. But gradually as we came to know and appreciate the different varieties we began in earnest to retrain and rehab the viable old vines and replace the misses with healthy young zin. Like the orphaned dogs we collect, this mutt of a block came to be a favorite because of its unusual pedigree. Named for Tina Maple who collects lots of things and hates throwing anything away. TOMs block. 100% petite sirah also planted in 1990, near the house on a slight, clayey rise. Popular with the winemakers and displays glorious fall foliage. Tom Maples favorite. DAN & JESSEs (Contreras) blocks. 100% zinfandel budwood saved from the vigorous old vines in the Twisted Oak block (known then as the APPLE TREE block) were custom grafted onto St. George rootstock and planted in 1993. Has one row of Franken-vines, so named for the giant carignane, black malvatia and petite sirah it contains. Dan and Jesse Contrerars are good and longtime friends, mechanical whizzes and integral parts of the harvest team. Blocks 1-6, named for dog friends: BOO, ANNIE, URSA, YIPPEE, PIP & OSO, respectively - 5 german shepherds and the Pip. A homogeneous 10 acres of zinfandel planted in 1963 and headed higher than usual. The eastern edge has 2 huge olive trees known to be 100+ years of age.